Learning the letter F? You've come to the right place! We've got all sorts of letter F posters and other printables here. F is the letter on this playdough mat. It's fun to model it with playdough, and perhaps stick on some beads or buttons or feathers to make a colourful letter F! F is for fun, and the kids are bound to enjoy learning the letter f by having a go at the activities on this worksheet! Here is a poster of a little boy holding up the letter F - perfect for your "letter of the week" activities! A little girl holds the letter F up high on this fun poster! This poster features an exotic flamingo. There is a whole set of alphabet posters which are perfect for you to decorate a wall at home or in the classroom. You could give your pink pens a workout too on our matching colouring page! These worksheets are a great way to encourage children to write the letters of the alphabet, and this one is for the letter 'f'. Can the kids think of fun ways to decorate this letter f template, maybe using items beginning with f, such as feathers, fur or flowers? Simply print out the template and let them get started! 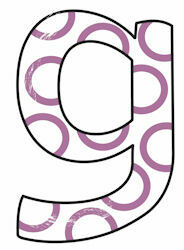 This quirky, fun letter F is perfect for crafts, scrapbooks and classroom displays. Simply print out the template then get the kids colouring and decorating!